The authors review the book “Greening the Academy: Ecopedagogy through the Liberal Arts”, by Samuel Day Fassbinder, Anthony J. Nocella II and Richard Kahn, from the point of view of Environmental Education, as well as from that of Education for Environmental and Ecological Justice. The review focuses on the importance of the book for tertiary (university level) educational fields. It tries to study the parts of the book within the framework of two major axes transecting all similar – environmental or ecological or justice – educational and research fields: the axis of “old vs. new” and the axis of “local vs. global”. 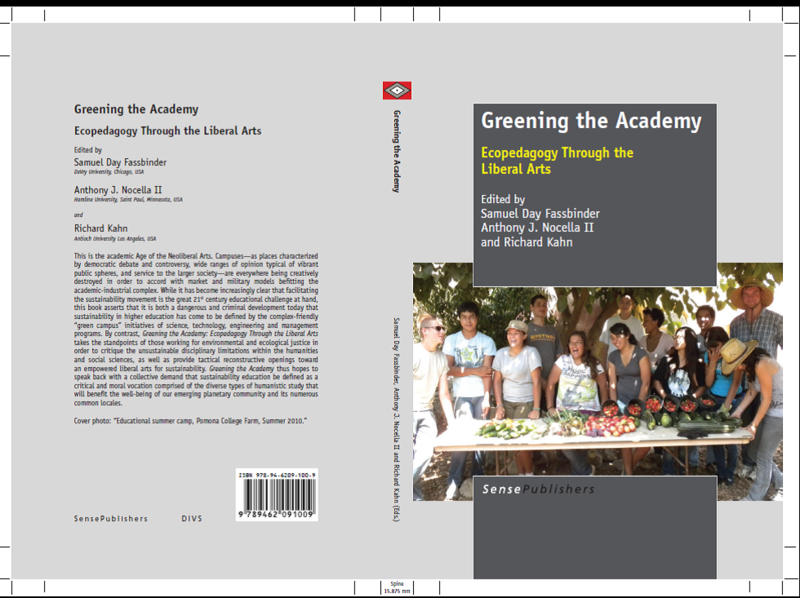 Greening the Academy: Ecopedagogy through the Liberal Arts, edited by Samuel Day Fassbinder, Anthony J. Nocella II and Richard Kahn. (2012), Rotterdam, the Netherlands: Sense Publishers, 250 pp. It is a widespread belief nowadays that environmental education is mainly an issue concerning the lower levels of education (primary and secondary) (Ham & Sewing, 1988; Breiting & Mogensen, 1999). At the same time, in universities, ‘Environmental education’ is frequently considered to be a domain of Science curricula in fields such as chemistry, physics, ecology, engineering and technology (Hicks & Holden, 1995; Stables, 2001). The major contribution of this great book / collection of papers by Fassbinder, Nocella II and Kahn, is – in our opinion – exactly that it denies the two aforementioned arguments. The book states that: first, environmental education must totally penetrate tertiary education too, if the latter is to produce critically thinking and “resisting” scientists of all fields, who would resist to the industrial complex and the militarization of sciences. Secondly, tertiary-level environmental education definitely should not limit itself to the science, mathematics, ecology or technology curricula, but should also cover the human sciences of all kinds, the law, economy, and what is called “liberal arts” (Giroux, 1988): i.e. all the necessary human science curriculum subjects needed to provide critically and progressively thinking scientists and citizens. The use of the term “greening” has long been used in a variety of contexts and meanings in sciences, academia, movements, and even in the martial and political vocabulary prevailing today. (Prothero & Fitchett, 2000; Wickenberg, 2000; Benton, 1996). Everyone – politicians, educational stake holders, military movements, activists, academia, international institutions like IMF, the International Monetary Fund, or the United Nations Organization – uses it in a different context, depending on their theoretical background, their beliefs, the things they are struggling for, their financial or political interests and benefits etc. But what the authors of this brilliant book seem to define as “greening”, seems to coincide with what we (working in an Educational Department of a Greek University, and also being politically active and alert scientists) define as “greening”: Environmental and ecological education should immediately – with no further delay – be put in the core of all levels of education, Primary, Secondary and Tertiary (Kahn, 2010). With the term “environmental”, an education is meant, that focuses more on the human interaction with the environmental factors. On the other hand, “ecological education” focuses more on systemic interactions within the environment, and focuses on other living populations, apart from the humans. Certainly, the necessity of introducing these forms of education in the Curricula, does not refer to environmental and ecological education simply as a scientific field, providing knowledge and expertise in a technical and scientific sense (Hungerford & Volk,1990; Kollmuss & Agyeman, 2002; Tilbury, 1995; Jensen & Schnack, 1997). On the contrary, it means that environmental, as well as ecological education and justice education are formed and introduced in the curricula, in order to create citizens and scientists of all fields (Cole, 2007) who are critically thinking, who are politically aware and active and who are forming academic communities that are sites of resistance to neocolonialism and to corporate control. The authors and the editors chose to reflect only upon the role of the so called “liberals arts” (Blaich et. al., 2004), in the transformation of tertiary education towards a direction of environmentalism, ecological justice and non-anthropocentric critical thinking. The reason is that these arts are the ones mainly responsible for creating citizens and scientists with an active and communicative role in the society (Seifert et. al., 2008). Only human sciences were, correctly, chosen as a site of study in this text, since – as was earlier discussed, the role of the other fields of science has been discussed thoroughly in the literature (Lucas, 1980; Gough, 2002; Hodson, 2003). Apart from that, these latter scientific fields mainly treat the term “greening” in a rather reductionist, rationalist and technocratic manner, a manner which tends today to suit the needs of capitalistic expansionism, of the multinationals and of martial alliances (Best, Nocella II & McLaren, 2009). The only possible drawback one could find in the volume would be the absence of a Chapter on greening law studies. The book is useful for the Greek readers (academic or not) for three reasons; a) the liberal arts and the human sciences in the Greek Universities today pay almost no attention to environmental or ecological matters and the respective justice issues stemming from these fields. The reason is that the academic teachers of liberal arts and human sciences consider them to be more an area of study for the faculties of science and technology (Fien, 1993; Ratcliffe & Grace, 2003) b) many educators in the fields of economics, literature, law, history, humanities etc, have a lot of intertwining with the industrial and banking complex that rules the country, especially its politics and education. Many of them are ministers in the cabinet, authors of books for primary and secondary schools etc. (Panoussis, 2008; Kimball, 1990). Thus, there is total absence within the Greek liberal arts’ and human sciences’ academia, of ideas, actions, writings or voices about environmental and justice-oriented critical thinking. Towards this direction, the current book has a lot to contribute. c) Making environmental and ecological justice education more a “toy” or “gaming activity” in the Primary and Secondary Schools, deprived of any political meaning (with the brave exception of some brilliant primary and secondary school teachers) entails tremendous lack of theoretical background for major peoples’ movements, leading the latter to a gradual degeneration. Good examples of this, are two ongoing major struggles in Greece (including fights with the police, sometimes the Army, and – of course – the local incumbents and officials) : The struggle of the people in Keratea, a degraded outskirt of Athens, to avoid building a big waste landfill in their land (Douzinas, 2012; Botetzagias & Karamichas, 2009) and the struggle of the people around Asopos river, a river between Attica and Boeotia, to stop the water of their river being polluted (better say: poisoned) by the local industries (even Erin Brockovich is involved in the struggle of the latter) (Holst-Warhaft & Steenhuis, 2010). With a book like “Greening the Academy”, such environmental and ecological justice struggles could achieve a strong theoretical background outside the society – where they are already strong – in the territory of tertiary education. Figure 1: The two intersecting theoretical axes, delineating all kinds of involvement with Environmental Education, Ecological Education or Justice Education (Gkiolmas & Skordoulis, 2006). It should be stressed that wherever an environmentalist, ecologist or social / environmental justice theorist and activist chooses to be situated in the context of Figure 1, this position by itself does not identify him or her as radical, critical, progressive or – on the contrary – conservative and neoliberal. The individual’s actions and thoughts or writings do that! 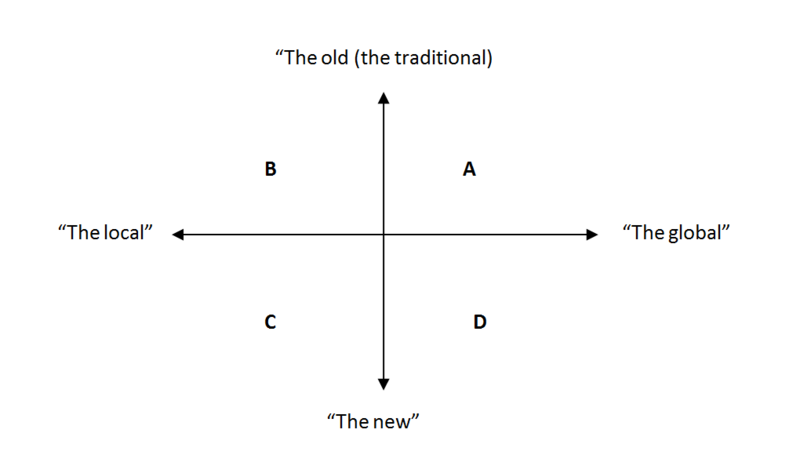 For instance, one may be in Quadrant C of Figure 1, and be radical and progressive, in the sense that one views “greening” as protecting the local cultures and the attitudes towards the ecosystems, of indigenous people in an area, and also claim that this must be done with new methods, using the Internet, the social media, Wiki-spaces etc. (Rohwedder, 1994; Briano et al., 1997; Stables & Bishop, 2001). Another person could be located in Quadrant C of Figure 1, and be totally conservative and neo-liberal in the sense that the individual favors the local environmental and economical development of an area or city, regardless of the fact that it will ruin the neighbouring areas and civilizations or ecosystems, and he also introduces new methods of greening like GMO plants and foods, destroying ecosystems’ balances and peoples’ health. (Leeming et. al.,1993; Cutter-Mackenzie & Smith, R., 2003). Fassbinder is more on “Quadrant C”, favoring “the local” and “the new”. We focused more on his paper, due to our interest as educators. 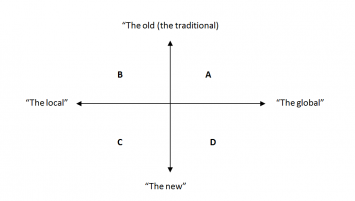 Beirne and South are more on “Quadrant D”, favoring “the global” and “the new”. Animasahaun is more on “Quadrant D”, favoring “the global” and “the new”. Luke is again “Quadrant D”, favoring “the global” and “the new”. Best (an anarchist and non-anthropocentric Ecology theorist, very well known here in Greece) is more on “Quadrant A”, favoring “the global” and “the old (the traditional)”. Kennet and Gale de Oliveira are more on “Quadrant D”, favoring “the global” and “the new”. Houston, whom we respect a lot as researcher, both her and her husband Greg Martin, finds herself more in “Quadrant B”, favoring “the local” and “the old”. 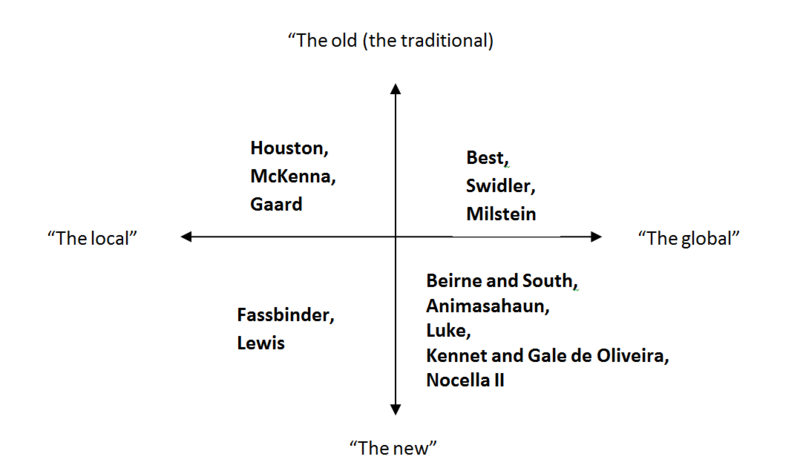 Swidler is more on “Quadrant A”, favoring “the global” and “the old (the traditional)”, in the sense of historical perspective. McKenna is again more in “Quadrant B”, favoring “the local” (local communities) and “the old” (historical analysis). Milstein is located rather in “Quadrant A”, favoring “the global” (overall study of Nature in its communicative role) and “the old (the traditional)” (historical study of the concept of environment). Lewis can be situated in “Quadrant C”, favoring “the local” (focusing on American literature) and “the new” (impact on modern neo-liberalism, capitalism and on attitude towards Nature). Nocella II is rather within the theoretical context of “Quadrant D”, favoring “the global” (all-inclusive environmental and sustainability education for all) and “the new” (the new scientific paradigm of eco-ability, as a concept that connects environmental education and action, with social justice and elimination of all kinds of discriminations). 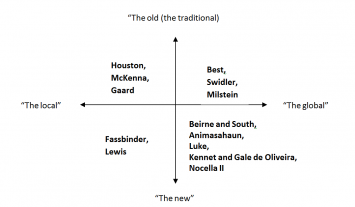 Finally, Gaard would be put in the context of “Quadrant B”, favoring “the local” (the specific contribution of feminism in “greening” education) and “the old” (historical review of it). In Figure 2, each of the authors of the book is located into the corresponding Quadrant of Figure 1, which describes the trends in environmental, ecological and justice Education. Figure 2: The authors of the book each located into the corresponding Quadrant of Figure 1. All the authors of the volume use excellent critical and radical argumentation and approaches. Some of them deal with “greening” from a more historical perspective (“what has been done” in order to “green” or how a particular academic field contributed to “greening”), others describe more the current situation and if, how, and to what extent the specific field contributes to “greening”, as well as the reasons for this kind of contribution and finally many of them reach to a point of “what has to be done – as soon as possible – to introduce “greening” to the specific field, or to alter drastically the way that this field adds “greening” to tertiary education. If we want academic life and activity to continue resisting the tremendous pressure on behalf of neo-liberal, commercial and martial global interests, and to continue – or in some cases, start – producing critically thinking and alert citizens, or producing knowledge and research for and about people and the nature and not for industries, we must immediately take a decisive turn. That is to introduce and diffuse as large amounts as possible of environmental, ecological, critical and based-on-justice education and action within university campuses. Benton. T. (1996). The Greening of Marxism. New York: Guilford Editions. from the Academic Industrial Complex. Berkeley, CA: Editions AK Press. Blaich, C., Bost, A., Chan, E., & Lynch, R. (2004). Defining liberal arts education. Technology for Teacher Education, Volume 6, Issue 2, pages 127 – 146. Education, Volume 38, Issue 2, pages 35-45. Volume 9, Issue 4, pages 497-524.
environmental education. Geelong, Editions: Deakin University Press. curriculum discourses (pp. 243-263). Arizona: Gorsuch Scarisbrick. Education. M.Ed. Dissertation (Constantine Skordoulis as a supervisor). Education, University of Athens, Greece. Journal of Environmental Education. Volume 19, Issue 2, pages 17-24. Hodson, D. (2003). Time for action: Science education for an alternative future. International Journal of Science Education, Volume 25, Issue 6, pages 645-670.
crisis in Mediterranean. Editions: Ashgate. Volume 21, Issue 3, pages 8–21. Ecopedagogy, Volume 4, Issue 1, pages 1-14. Ecopedagogy Movement. New York: Peter Lang Publishing, Inc.
Higher Education. New York, NY. Editions: Harper Row. environmentally and what are the barriers to pro-environmental behavior? Environmental Education Research, Volume. 8, Issue 3, pages 239-260. Environmental Education, Volume 24, Issue 4, pages 8-21. Green Commodity Journal of Macromarketing. Volume 20, Issue 1, pages 46-55.
socio-scientific issues. Maidenhead: Open University Press. Volume 8, Issue 3, pages 123 –125. Research, Volume 7, Issue 1, pages 89-97. Research, Volume 1, Issue 2, pages 195-212.
environmental education processes: Perspectives on a growing research arena. Environmental Education Research, Volume 10, Issue 3, pages 353-370. Local Agenda 21 in Europe. Lund: Editions Lund University.